Zing zing zing… ideas hit us all the time. Generally, we jot those down on our iPad to think more about later. Sometimes, they are more like little questions we are curious about and will launch one of our iPad’s search apps to find an answer. We don’t always need an answer to our question this very second but search apps don’t let you add a lit of questions to be looked up later. Well, that is until Dunno. 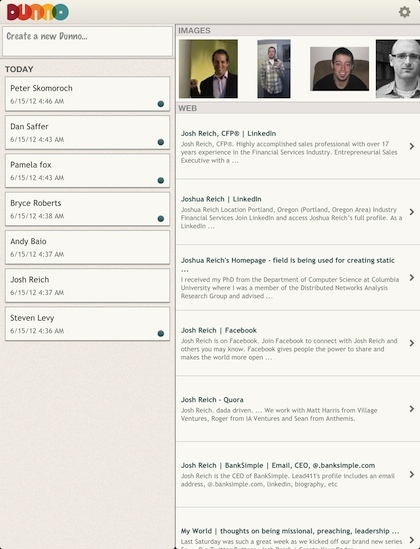 It’s an iPad app, it’s a iPhone app, it’s desktop software, it’s a service… and it’s all free! 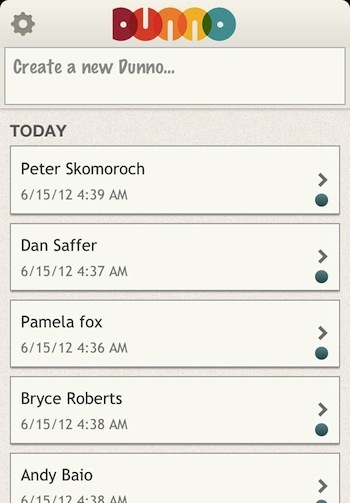 Imagine, a notepad app that syncs through a free cloud service to all of your devices. Nothing too new there, we have several we use every day. Now, imagine if what you enter into the notes is searched across multiple systems in the background and the results are available to you when you want. We are pretty sure, that is just what we coved as something we needed. 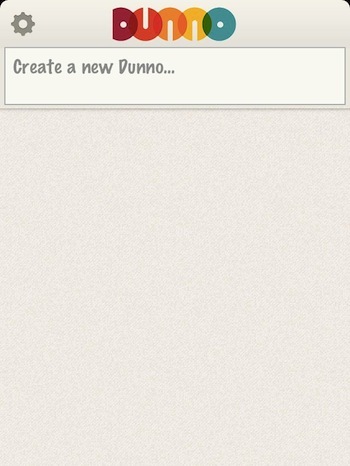 The answers to ‘more information requested’ on any text we put into the note boxes of Dunno happens pretty quickly. But, since it is all in the background, we are not forced to look at the answers now. Have a question about what something is or a word you need more info on or if anyone else is doing an idea you have, just enter that text into Dunno and check on any of your devices when the timing suites you. Putting the service and concept to the test, last weekend several of us where at a three day event where many of the tech and government mover/shakers where at. Our team has people that know people and people that don’t know the name/face but are still very interesting folks due to their understanding of what makes things work. Each of us was armed with a iPhone and iPad, when we saw a name we knew or was interested to meet, one of us would jot their name down in Dunno on either device. No need to add anything like “he’s the guy that invented the ____”, instead Dunno did the leg work for us. The folks that wasn’t in the know had a very quick way to tap a person’t name and see more info. Interesting use of the technology, but it worked GREAT!! Of course, this is just an example of what to use the app for, your more serious needs to know more without taking the time to research should be able to be met with Dunno working for you. Imagine sitting in a meeting or walking down the street, just type in a bit of text and get back to what matters. Initially, after ending some text, the box with the text in it will be just the text. A dot appears in the lower right corner of the box when Dunno has delivered more information. Select the text box with the dot in it to view Dunno’s more information. The dot disappears after you have viewed the information, but the info is still available to view again later.